31/7-The ongoing investigation to determine the depth of former Gazette reporter Hil Spencer’s involvement with Doctor Argyle Von Grimm’s gang has produced some startling evidence. Law enforcement officers have finished an intensive search of Mister Spencer’s home, and claim to have found several documents that indicate Spencer was not only in contact with Von Grimm, but at least two other unrelated entities expressing anti-triumvirate sentiments. One of these groups is the same organization that conspired to assassinate the Governor of Crowndon, Barclay Ancroft, earlier this month. Colonial authorities have not revealed any details of the third party. The Colonial Marshals have reportedly requested the assistance of a cryptanalyst to help ascertain any hidden message that may be contained within the correspondence. While they did not divulge the specifics of what they are looking for, they intimated that Mister Spencer is nothing more than a middle man for a larger, more nefarious group. Other evidence uncovered from Mister Spencer’s estate included a large stash of weapons crates containing the same unmarked semi-automatic rifles that have been surfacing in rebel uprisings around the Sarnwainian Empire over the last few weeks. The Marshals and Colonial Heads of State refused to comment on the implications of this. Blackwood Gazette # 168- Dismissive Smile Sighted in Sarnwain: McKilroy vs. La Pierre Round 2? 30/7- Ever since his explosive escape from the ruins of Gerrza in Pharassus two weeks ago, no one has seen or heard from infamous air pirate Captain Roderick Beauchamp La Pierre. Rumors persist that he is somewhere in Sarnwain, likely having taken to ground in the dense jungles along the eastern coast to finish repairs to his ship. It should come as no surprise then that La Pierre’s arch nemesis and former crew mate, the pirate huntress Captain Johanna McKilory, was recently spotted in the skies of the Sarnwainian Kingdom of Djidan on a course for Pharassus. There could be other reasons for her arrival in Sarnwain, of course. Captain McKilroy is now almost as wanted in the Triumvirate as her prey to answer for destruction incurred while hunting said prey and escaping from Crowndon authorities several months ago. Some people fear that McKilroy might even be seeking an alliance with La Pierre, though many people investigating the situation agree that this scenario is unlikely. 29/7-The forces of Alejandro Julianos suffered a stunning setback earlier this week when a large force of rebels, said to have been led by Dougherty herself, attacked a small airfield in Govanna. However, instead of destroying or sabotaging equipment, as has been the modus operandi of the rebels to this point, Dougherty’s forces instead captured twenty of Julianos’ fighter planes. Military analysts say that the addition of these aircraft to Dougherty’s forces could give her a chance to devastate a large portion of Julianos’ resources…if she has the talent available to fly them and the strategic reasoning to deploy them wisely. “It might not seem like much to the layman,” said Enricio Falar, a teacher of military history and wartime strategy at Monteddor’s Aeronautical Warfare Academy. “But twenty fighter planes is a large number. These aircraft are still pretty rare, and twenty of them accounts for nearly ten percent of their number in existence, world-wide (those are the most recent estimates, anyway). 27/7- The Triumvirate Authorities report today that a small uprising occurred in Ganborah late last week. The uprising, which bears striking resemblances to the rebellion in Thankaen earlier this month, managed to overtake the country’s Parliament building before being cornered by the Royal Army and suppressed. While some experts analyzing both situations have suggested the possibility of some outside party stoking unrest against the Sarnwainian monarchies, the majority have ruled that this is no more than paranoia. However, in both circumstances unconfirmed reports have claimed that rebels were supplied with cutting edge rifles capable of rapidly firing rounds in quick succession without the aid of a lever. Similar weapons were reportedly seen in the possession of Territorial scouting parties along the frontier of the colonies last month, suggesting that this occurrence may not be restricted to Sarwainian interests. The head of the Triumvirate Authority Military Committee, Authority General Thomas Holcombe, stressed keeping our imaginations in check. I’ve been throwing around the names of a lot of new places recently. At a loss for where everything is? 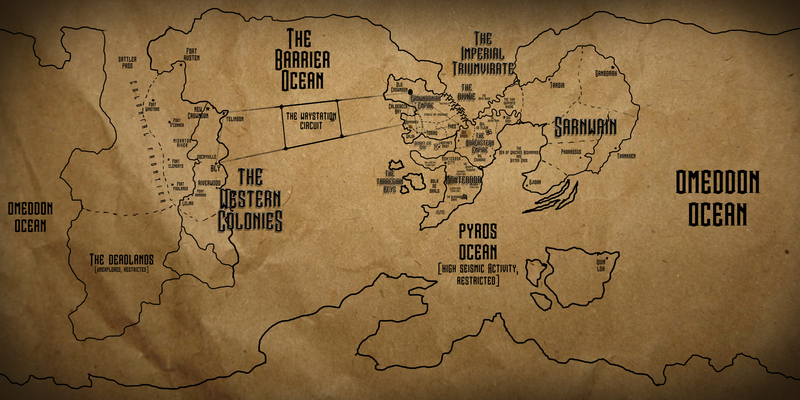 Check out this handy dandy map of the world of the Blackwood Empire. 23/7- In the short time since its release, Pierre Fordeau’s memoir “Impossible Hearts in Forgotten Lands” has captured the imaginations (and coin purses) of readers all across the Triumvirate. But at least one reader, who also happens to be a major figure within the story itself, is anything but happy. “I don’t know why everyone is calling this a memoir,” said Seylene Plamondon, the dread pirate Queen of the Pyrossi skies who commands a fleet of one hundred air ships. “Everything in it is a complete fabrication. Especially the bits about me and our so called torrid affair. “Fordeau was indeed aboard my ship. But only because we sacked the ship he’d been traveling on previously. We killed its crew and bound its passengers, only taking Fordeau because of his renown. I figured he’d pull a hefty ransom. This account begs the question: why didn’t Plamondon just kill Fordeau, rather than putting up with him all the way to Pyros? Given the stories about her, she’s never had any compunctions about slaughtering people who prove to be a burden to her, a number which includes her father, two husbands and a daughter. Will Captain Plamondon be seeking legal action against Fordeau? 22/7-It was widely believed that the attempt on Governor Berclay Ancroft’s life two weeks ago was the work of Triumvirate Loyalists, but a recent claim by a separate group suggests a much more complex scheme. While the group that Nor Eastern spy Pixie Sinclaire infiltrated was indeed comprised of Triumvirate loyalists, a letter sent to the Gazette claims that the scheme was concocted by a movement of Territorial sympathizers who fed to loyalists information about where and when Ancroft would be arriving and how to go about carrying the attack. The group, calling themselves the Advocacy of Original Peoples, list a number of demands in their letter. The chief among these demands is that all Triumvirate assets in the colonies be abandoned. They call for the dismantling of factories and towns, and for all colonial citizens to withdraw within one year. If these demands are not met, they say, then the lands of Orend-auch-Tourna, the Duv Ayid name for the Newland continent, will run red with blood. Reception of the letter has led the Governor to call for a full investigation into the Territorial Council, to see if any of its members were complicit in the attack and threat. It is the belief of the Marshal’s office, however, that the Council has nothing to do with the plot, nor any person of native heritage. “These sentiments are not common amongst groups of people from the territories who reside in the colonies, outside of the extreme fringe,” said First Marshal General Job Stoll. “They are, however, sentiments we’ve seen expressed by groups of young colonial adults, mainly in Nor Eastern colonies. It is our belief that these sentiments have grown into a small movement, but nothing we need to fear just yet, as the foiled attempt on Ancroft no doubt came as a bitter blow. Using the Marshals’ own arrest records, we reached out to one young man arrested in the colony of Bly for defacing a monument with anti-colonial sentiment. While reading your article about the group demanding that Triumvirate interests in the Newlands abandon their endeavours, I could not help but notice the distinct lack of a native point of view in the piece. Everything I read had to do with the perspective of colonials, be it the Marshals, or the members of the organization calling for withdrawal. Where is the input from those most affected by these happenings in colonial society, the native peoples themselves, whose fate hangs upon the decisions of these two groups? What is their opinion on these matters? I feel it is an important piece of the discussion. This correspondence was never published nor answered in any public light.